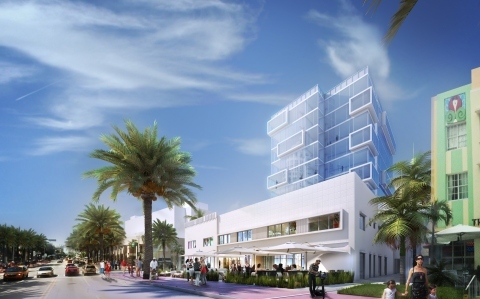 CHICAGO--(BUSINESS WIRE)-- Hyatt Hotels Corporation (NYSE: H) in conjunction with Miami-based development group Robert Finvarb Companies and its partner David Martins today announced the opening of Hyatt Centric South Beach Miami, a 105-room lifestyle hotel bringing the first Hyatt Centric-branded hotel to Miami Beach, and the second Hyatt Centric property worldwide. Upon arrival, guests are led to a central lobby lounge on the third floor where they can enjoy handcrafted signature cocktails at the bar and browse through the hotel’s curated book collection in The Corner. Outside is a stunning, open-air deck featuring a swimming pool where guests can leisurely soak up the Miami sun on lush lounge chairs or unwind in shaded cabanas. The hotel also offers a distinctive indoor-outdoor lobby on the third floor with public spaces available for guests to recharge and socialize. Hyatt Centric South Beach features a Spanish-Mediterranean restaurant, DECK sixteen, offering a locally sourced menu for breakfast, lunch and dinner, with the talented Executive Chef William Milian at the helm of the kitchen. Additional food and beverage amenities include pool and beach service and Hyatt Centric’s signature restaurant-to-room dispatch service, which delivers selected menu items and cocktail kits in 20 minutes or less. The hotel also offers a unique roster of conveniences including a fitness center and a number of off-site amenities, such as custom-designed bicycles and specially priced services at the famed exhale spa, where luxury spa services and award-winning fitness programs are at the tip of guests’ fingers. In addition to catering to leisure travelers, Hyatt Centric South Beach also offers business guests a stylish boardroom on the second floor for meetings. The hotel allows for convenient connectivity with complimentary wireless Internet throughout the property and a state-of-the-art Bluetooth enabled TV systems with full audio and visual services. Hyatt Centric South Beach is located at 1600 Collins Avenue. For more info, visit Hyatt Centric South Beach Miami. Hyatt Centric is a full-service lifestyle hotel created for modern explorers, a multigenerational group comprised of travelers who view their hotel as more than a place to stay. While each hotel has its own personality and offers guests a story to tell, thanks to its eclectic and fun touches, the Hyatt Centric brand is characterized by certain signature elements, including spaces like The Corner, where guests can work, socialize and peruse a curated collection of local books and magazines, and a bar and restaurant area that help foster great conversations and deliver thoughtful, locally inspired food and signature cocktails. Hyatt Centric hotels are centrally located in every destination – this means being both “in the middle of the action ” and “in the know” so that both leisure and business travelers can easily explore the destination and get a feel for the local flavor. Hyatt Centric is designed with the concept that “sometimes less is really more.” All the must-haves that guests expect from a full-service hotel are there but in the most intuitive and simple way (e.g. associates who will help with bags, if desired, and express dispatch service allowing guests to enjoy gourmet food and craft cocktails in their rooms without formal delivery). While guests can enjoy the in-room technologies designed to connect seamlessly with their devices and media, a staff of knowledgeable associates is on hand to aid guests in their discovery of the destination – particularly useful for business travelers with limited time for exploration. About Robert Finvarb Companies: Robert Finvarb Companies (RFC) is a private real estate investment and development company based in Miami, Florida. Robert Finvarb, founder of the company, started his development career in 2002. Since then, RFC has developed fourteen hotels containing approximately 2400 guestrooms that operate under various Marriott and Hyatt brands and are located in six states and the District of Columbia. Currently, RFC is developing two mixed-use projects that contain both hotel and retail components in New York City and South Florida. RFC has a reputation for developing high-quality, institutional grade assets and possesses a track record of success in all market cycles. As a private company, the principals invest their own equity in all projects and are personally involved in all phases of the project. In addition to developing its projects from the land acquisition stage to their opening, RFC oversees the sales, marketing, accounting and administration functions that are primarily undertaken by its management staff at each hotel with a sophisticated cadre of in-house professionals.